Dazzling Magic – Set 2 of a 4 part series of magic tricks for any occasion. Fascinate your friends with amazing magic tricks! Dazzling Magic! Make objects disappear from your bare hands, perform brilliant card tricks, make money travel ‘invisibly’! Includes clear step by step instruction book. 25 tricks! 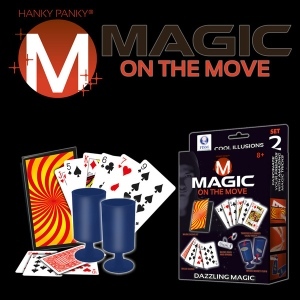 Such as Twisted & turned card trick, Magic booklet, Magic ring and spring, Magic money cups and Magic cards.